CONVERTS YOUR VERSATTACH POWERHEAD INTO A POLE PRUNER: The pruner attachment makes your VersAttach powerhead into a heavy duty pole pruner suitable for both residential and commercial use. CUT BRANCHES DOWN TO SIZE: The VersAttach pruner attachment maintains constant torque to help you get through the toughest of branches. It can get to high places with its extended shaft. 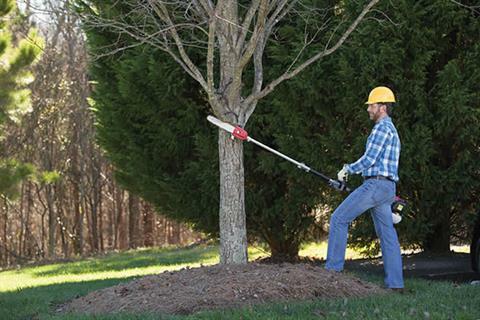 And with a 12" blade, it can cut through a variety of limbs with ease. MULTI-TOOL FLEXIBILITY: VERSATTACH SYSTEM: The pruner is part of Honda's exclusive VersAttach System. It is interchangeable with any of 5 other options: trimmer, edger, hedge trimmer, cultivator, and blower. PAIRS WITH BOTH THE UMC425 AND UMC435 POWERHEADS: The pruner attachment connects with either Honda VersAttach powerhead for instant power. TRANSLUCENT OIL RESEVOIR: The pruner has a translucent oil reservoir, which makes it simple to check the level visually and prevents the attachment being damaged. Sharpening File - Round 5/32 in.